Late night pie happens like this: come home from the cherry orchard as the sun begins its slow descent. Wonder, how will we eat six pounds of cherries? Think: pie! Proceed to look for a cherry pitter, come up with fingers. Settle for a piping tip. Make pie dough. Rub long sheets of cold butter into flour, inhale the tangy scent of vinegar. Scrape it off your fingers, shove it into the freezer. Take a break! You deserve it. Eat some cherries. They are very, very good. Remember the pitted cherries in the bowl. Scrape out a vanilla bean, think how the seeds look like tiny stars, if stars were black. Add sugar, lemon and let it sit tight. Dinnertime. It’s almost dark out. Feel the pie-dough. Nope, still not cold enough. Wait some more, maybe take a nap. Now it’s dark out. Completely. How has it gotten so late? No matter. Take the dough out- it’s perfect. Roll it out, get flour everywhere. Feels nice and pliable, very cold. The streaks of butter are visible in the dough. Press it into the plate, and pour in the cherries; they waited patiently and now they’re sweet and juicy. Rush it into the freezer. Roll out the second dough. Cut strips for a lattice. Uh-oh, they’re starting to stick to the table! 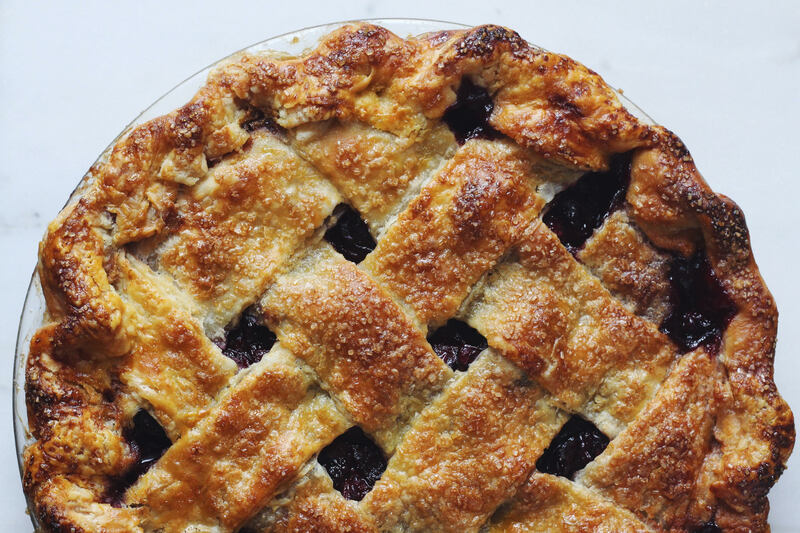 Take the filled pie shell out, do the quickest lattice ever. Brush it with egg, so much sugar, send it into a very hot oven. Now, wait. Catch up on the news. Clean up. Mmm, something smells good. Take the pie out. It’s bronzed and bubbling with juice. To wait or not to wait? Of course, not to wait! Cut a hot piece. The clock reads almost exactly 11:30 PM. Who cares? Dig in! Woah, that’s good. That’s good pie. Now it’s bedtime. Sweet pie dreams follow. Why I love this recipe: sugar and vanilla bring out the sweetness of sour cherries and lemon juice ensures that their tartness doesn’t get lost. The pie crust is flaky, thanks to frozen butter and vinegar, and bakes up sturdy, due to a bake at high temperatures on the lowest rack. Notes: be sure to let the pie cool for a good amount of hours (3-4, at least) in order to cut neat slices. If your cherries are very sour or sweeter than usual, you may want to adjust the amount of sugar. I found one cup was plenty, but I do like my fruit pies tart. Go according to personal preference. Combine the cherries, sugar, cornstarch and vanilla bean caviar (seeds). Let sit while you roll out the dough. Remove your dough from the freezer or fridge. Then, working gently, roll out one disk of dough into a 12″ circle on a floured surface. Trim the edges. Bake for 15 minutes on the lowest rack of the oven. Lower heat to 400 and bake for another 45-50 minutes, until the top is browned and the juices have thickened and are bubbling. 17 Jul	This entry was published on July 17, 2015 at 1:45 pm. It’s filed under Delectables and tagged butter, cherry, food, fruit, photography, pie, pies, recipes, seasonal, sour cherries, sugar, summer. Bookmark the permalink. Follow any comments here with the RSS feed for this post. Wow. That looks amazing. I love the style you used to describe how you made the pie. I can almost see it. I particularly enjoy the description of all the mess you make while making the pie. That’s how my pie making goes! I love making late night pie. Oh, and thank you for the link on making a lattice top. That’s the first description I’ve read that ever made any sense. Later this week I’m going to try my first cherry pie. (A slab pie for a big picnic.) I only hope it’s half as good as yours looks! thank you for your kind words Carl! I hope your pie comes out delicious, and if you attempt a lattice, let me know how it goes. after a couple of times, making one becomes effortless and instinctual. thank you for reading! Perfect indeed! Sour cherries are the best. thanks! aren’t they? their season is too short. Oh wow, looks so amazingly gorgeous! My mouth is puckering thinking about those tart cherries! Ohhhh this is so my kind of pie. The cherries are beautiful and the crust looks perfect. What gorgeous tempting photos. If these are the pies you’re selling, I’m buying. Beautiful, Chaya. Just perfect! Weird that there was no link. I’ll look into it. Oh wow re: an order for your pie. Amazing. I should try your crust. I’m shopping around for different crust recipes. Enjoy your weekend too! I think it might be because I was reading it from my phone. not sure, but I’ll try again on my computer. let you know! This pie looks absolutely delicious, and sour cherries are my favorite. Great job! thanks Jess! I’m pretty in love with sour cherries, too. sour fruit is my favorite! have a wonderful weekend.